First thing is first, though. A “composite” is anything that is made of other things. A composite material is made by mixing other, simpler materials. The “composition” of something is what you ask about when you want to know what elements were used to create it. A composite image, therefore is just a term for any image that was made from one or more other images. The best known example of compositing is when a weatherman stands in front of a blue or green screen, and some technology is used to make it look like he is standing in front of a whizzy animated weather map. I usually use this example when explaining compositing, but that tends to lead people to believe that all of compositing is just a matter of keying out a green screen so that you can see a different background. I guess I’m bad at explaining it. So, for the purposes of this breakdown, I have made a composite shot which involves no greenscreening. It starts with some footage. Then, I added some rain, and I made the lights in the windows of the buildings blink as if somebody was controlling the lights to play a game of pong, and finally I made the red stoplight flicker red, yellow, and green. The video shows a lot of the intermediate elements that were used in creating teh final shot. Hopefully, this gives some impression of the sort of work I mean when I mention “compositing.” I am looking for feedback to know if this makes any sense at all. I am not going to take the time to make a full course in exactly how all this is done with step by step instructions for a complete beginner, but I would be glad to add more information if somebody makes a good suggestion of something I need to add for clarity. ** edit: I used to have an embedded flash video for convenience here. Unfortunately, try as I might, I couldn’t get a flash video with high enough quality that you could even see what I was talking about. I tried different encoders, different codecs, bit rates, etc. So, just QuickTimes. If you had a problem with the QuickTime file that was originally up, I have re-encoded the video using an older QuickTime codec called Sorenson. If your QuickTime installation is not up to date, hopefully this will still work. If it does not, I can only reccomend downloading the newest version of QuickTime. In response to the posted question, I have recently become a big fan of Shake, and use it as my primary compositing tool. 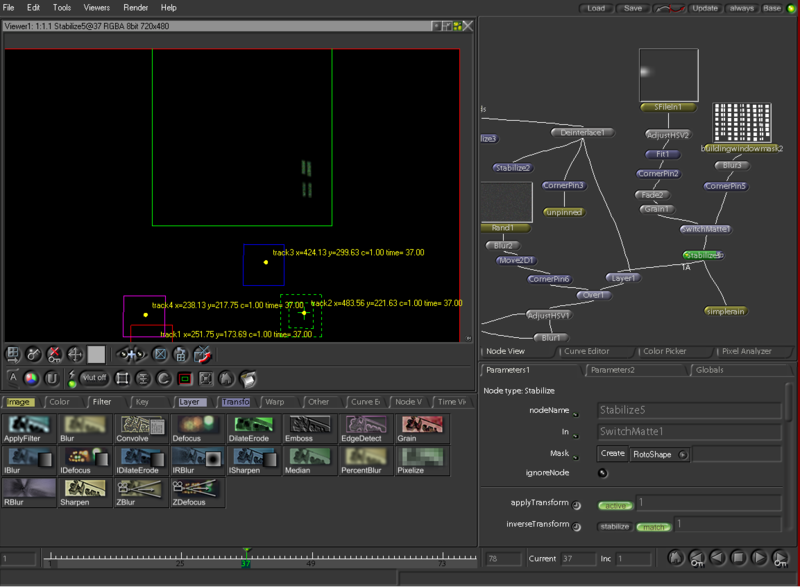 It is a node based compositor, rather than a layer based compositor like After Effects. It doesn’t have all the bells and whistles of Nuke and D-Fusion. 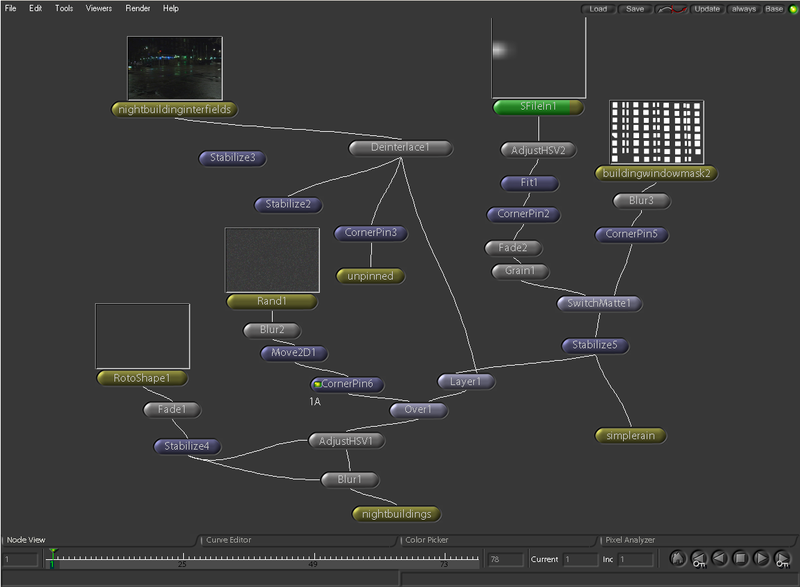 (Full 3D Compositing and Particle Systems, most notably) but, I have found it to be an extremely useful tool. It readily supports scripting out the wazoo, and it uses a simple text file format for the comps, which would allow you to create a whole composite shot using only a text editor, and just writing it as a script, in case you were a brain damaged masochist. I have made two screen shots made with the shot I have used as a demo. One screenshot shows the full interface as I normally work. The other shows the DAG ( aka “Node Graph”) zoomed to full screen where you can see each step in the process as a node more clearly. I cleaned up the node graph to make it a little more clear. It was actually a bit of an ugly tangled mess while I was in the middle of tinkering, and there were other chunks of it used for intermediate tests that didn’t have anything to do with the final shot which I removed for a slight boost in clarity. So what program/s do you do you currently do your compositing in? X-Bender: Oh no! Not the magnet!